Students create an artistic installation at the Garden entrance. 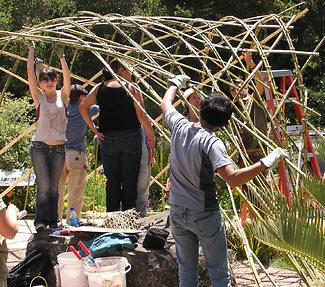 BERKELEY — UC Berkeley Architecture grad student Marisha Farnsworth, a permaculture-design instructor, worked with students in her Merritt College “Natural Building” class to create a structural art piece for the UC Botanical Garden entrance over the May 21-22 weekend. Using bamboo harvested primarily from the Garden’s Asian and South American collections, the structure combines modern design with traditional building techniques. Visitors to the Garden can walk through the installation for the next month. Fabric, colored with plant-based dyes, will eventually be added to the piece, to turn it into a semi-shade structure for the Garden’s Green Gala celebration on Saturday, June 18. With sustainability as its theme, the Gala will feature a sustainable-fashion show in the redwood grove amphitheater located across Centennial Drive from the Garden entrance. For information on the Green Gala, see the UC Botanical Garden website.